Over the May Day 2011 weekend, when a Navy SEAL commando hit squad killed Osama bin Laden in Pakistan while NATO warplanes bombed a residential compound in Tripoli, Libya attempting to murder Muammar Qaddafi, we commented that “Barack Obama’s 2012 Reelection Campaign Has Begun” (see U.S./NATO Murder, Inc., The Internationalist No. 33, Summer 2011). 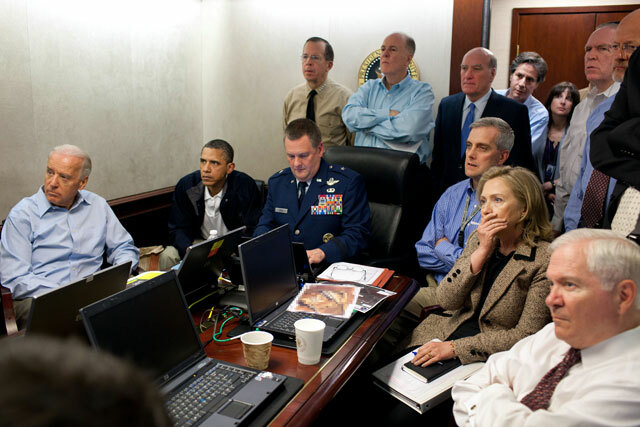 A widely publicized picture showed the U.S. president, Vice-President Joe Biden, Secretary of State Hillary Clinton, intelligence chiefs and military brass, eyes glued to a screen watching the assassination of the head of Al Qaeda (the World Islamic Front) in real time. The gang of war criminals in the White House Situation Room all wanted to be in on the kill. Sure enough, 15 months later at this year’s Democratic National Convention in Charlotte, North Carolina, Obama surrogates like Biden and Senator John Kerry whipped up the crowd to a kill-crazed frenzy, reveling in the execution of the Al Qaeda leader. As Glenn Greenwald commented in the London Guardian (7 September), “Almost every time Bin Laden's scalp was paraded around on its pike – all thanks to the warrior spirit and unflinching courage of our commander-in-chief – the crowd of progressives, liberals and party faithful erupted into a prolonged ‘USA. USA’ chant.” And in the final debate with Mitt Romney on foreign policy, Obama essentially accused the Republican of being a wimp for saying in 2008 that the U.S. should ask Pakistan’s permission before launching the hit. The Obama administration justifies its assassination program by claiming that it is much more focused on killing “bad guys.” How many civilian have been killed in drone strikes is unknown, since the U.S. refuses to release information about who and how many it guns down from the skies. For what its worth, all such murders (whether of “good guys” or bad) are illegal under so-called “international law’ and in violation of executive orders issued by Republican presidents Ford and Reagan – not that this ever put a dent in U.S. assassination programs. At most they just outsourced them to friendly dictators, such as under the U.S.-linked Operation Condor in Latin America which “terminated” upwards of 60,000 leftists and even the rare constitutionalist officer who got in the way of CIA coup plans. Recently, the Washington Post (23-25 October) published a three-part special report on “The Permanent War” which began: “Over the past two years, the Obama administration has been secretly developing a new blueprint for pursuing terrorists, a next-generation targeting list called the ‘disposition matrix’.” Moreover, aside from strikes in Pakistan, which are the province of the CIA, Presudent Obama himself personally authorizes the inclusion of each individual on this kill list, including American citizens. The Geneva Conventions on war, due process under the U.S. Constitution? Forget it. Once, back in 2008, the former liberal professor of constitutional law objected to waterboarding as torture. Now as commander in chief of U.S. imperialism, Obama is playing god, meting out what he considers “justice,” deciding who lives and who shall die. According to the New York Times (29 May), the lists submitted for approval by the president included a 17-year-old girl. And in September 2011, after a U.S. missile killed U.S. Muslim cleric Anwar al-Awlaki and another American from North Carolina (labeled an “Al Qaeda propagandist”), two weeks later a drone strike by the Pentagon’s Joint Special Operations Command (JSOC) killed Awlaki’s 16-year-old son. Asked by reporters to justify this wanton killing, a top Obama campaign official, former White House press secretary Robert Gibbs chillingly replied that Abdulrahman Awlaki should have “had a more responsible father” (The Atlantic, 24 October)! In the name of the “war on terror,” the president of the United States (POTUS) is running a global terrorist “assassination bureau” that is murdering children. The ghoulish terminology (kill lists are a “disposition matrix,” targets are “nominated,” missile strikes launched from Predator and Reaper drones are “kinetic action,” etc.) suggest the “newspeak” of Big Brother’s tyrannical regime in George Orwell’s novel 1984 or the sci-fi movie The Matrix and its sequels. In fact, the military researchers are already “working on software that ultimately could allow drones to work autonomously to hunt, target and kill enemy forces,” reported the Washington Post (19 September 2011). The White House insists its drone killing program is legal, based on memos by Justice Department lawyers. But just as the Bush administration refused to release secret memos which gave the green light to waterboarding torture, the Obama administration refuses to release its legal briefs authorizing assassination. The recent Washington Post special report detailed the rationale and workings of the matrix. It is a database that was put together by the National Counterterrorism Center (NCTC) to merge the separate kill lists of the CIA and JSOC, both of which run drone assassination programs. From being a spy outfit in the anti-Soviet Cold War that engaged in skullduggery and “dirty tricks,” up to and including “termination with extreme prejudice,” the Central Intelligence Agency has increasingly become a paramilitary force. JSOC, in turn, acts independently of the Pentagon chain of command, answerable directly to the White House, hence its nickname of the “President’s Army.” The matrix is constantly updated by the National Counterterrorism Center (NCTC) to include new “nominations” when “high priority” targets are taken out. Nominations to add to the assassination roster are discussed at a weekly conclave of top security officials, known as “Terror Tuesday” meetings. The recommendations are then presented to the president, who (as the 29 May Times article put it) usually “approves lethal action without handwringing.” The updated kill lists are then passed down to a global network of bases from which drones operate. Missile strikes against targets in Pakistan (334, almost all after Obama’s 2008 election) are launched from Afghanistan. Strikes in Yemen are carried out from a secret CIA base in Saudi Arabia and a JSOC base in the tiny African statelet of Djibouti, just across the Red Sea, which also handles Somalia. New secret bases have been set up in Ethiopia, Kenya, Uganda, South Sudan, Burkina Faso and Mauretania under the U.S. Africa Command. This global assassination bureau operating on “executive authority” goes hand in hand with assaults on civil liberties inside the United States. Capping the ubiquitous expansion of security and surveillance measures in the wake of 9/11, the defense authorization act passed by Congress and signed by Obama last December lets the president hold “covered persons,” including U.S. citizens, in military prisons indefinitely. Under the elastic definition of what constitutes support to “terrorism,” this could include anyone from Islamic charities to leftist anarchists picked up in FBI raids in Seattle and Portland in May. These are all facets of a drive toward militarized police-state rule to enforce U.S. imperialist hegemony. And anyone who thinks Democrat Barack Obama is the “lesser evil” here compared to Republican Mitt Romney isn’t paying attention.